MTJGD Manager Training™ 2019 – Digital! Home / Live Events / MTJGD Manager Training™ 2019 – Digital! More Than Just Great Dancing® Manager Training. This course is designed to equip your managers with the fine-tuned skills and systems that help run More Than Just Great Dancing® studios. Sample topics may include: Successful Staffing, Class Scheduling, Managing Students and Parents, Social Media Strategies, Positive Programs and much more! 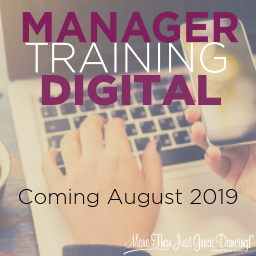 We are making some big exciting changes to Manager Training for 2019! Over the years we’ve received several requests to take Manager Training into a digital platform allowing members all over the globe to take advantage of this event. This new evolution to the training will save you and your staff time away from the office and travel expenses while still benefitting from all the amazing new and fresh content of Manager Training. Manager Training™ is only open to More Than Just Great Dancing® members and their managers.